This is truly the Best-Ever Buttermilk Carrot Cake on the planet! 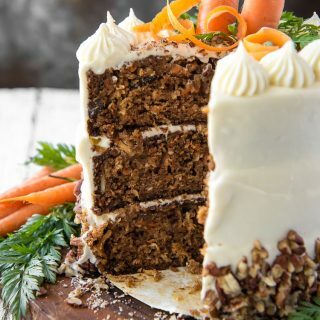 Learn the simple secret to making this moist, tender, homemade classic cake, complete with spices, shredded carrots and coconut, toasted pecans, and creamy rum cream cheese frosting! Until this beauty came out of my kitchen, I spent my life thinking carrot cake was overrated. Seriously. The Publix bakery (my old job) is known mainly for three things: fresh scratch bread, key lime pie, and carrot cake. Much like the deli’s subs, each has an almost cult following down here in the South. It is a good carrot cake, but given the choice between it and just about any other cake? I usually choose the other cake. Now that this crazy dense, moist, amazingly tasty cake has been on my table twice in two months, I’m never looking back. Homemade carrot cake forever! JUST TAKE ME TO THE BUTTERMILK CARROT CAKE ALREADY! 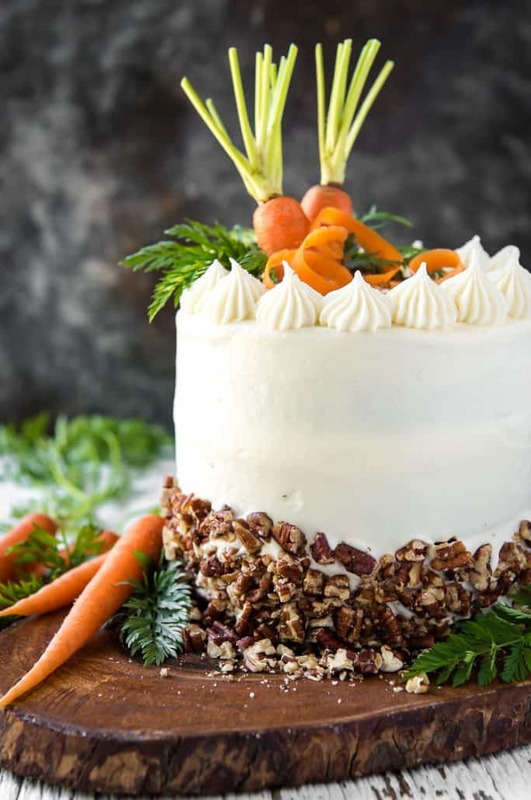 If you’d rather skip my (pretty darn helpful) tips and tricks, essential cooking info, and similar recipe ideas – and get straight to this deliciously easy carrot cake recipe, just scroll right on down to the bottom of the page where you can find the printable recipe card! Today’s #SpringSweetsWeek recipe is brought to you thanks to one of my favorite brands, Dixie Crystals Sugar! When I thought about what I wanted to use their products for for this week’s event, this to-die-for carrot cake I made for a family friend back in January was the first thing that sprang to mind. It employs three of their core products – granulated, brown, and powdered sugar – in a very deliciously layered way. As much as I like to tell myself that desserts containing fruits and veggies are better for me, the simple answer is no. Even the best carrot cake recipe is not healthy according to today’s standards, since it’s made with fats and sugars. However, eating a slice of carrot cake does supply you with loads of Vitamin A from the beta-carotene-loaded grated carrots. Very little beta-carotene is absorbable by our bodies naturally. Combining its source with fats and oils and baking it into a cake increases our system’s ability to process it. So even though this beauty needs to be eaten in moderation, at least you’re getting a little something extra out of it that devil’s food cake can’t touch. Can I Substitute Applesauce For Oil In A Cake Recipe? My carrot cake recipe is extremely moist, due in part to the use of vegetable oil in it. Using oil (whether vegetable, canola, olive, or coconut) instead of butter keeps the cake lighter and more tender than melted butter would. For an even healthier carrot cake, replace all of the oil with an equal amount of unsweetened applesauce. Since applesauce is water-based with zero fat, the texture of the cake will be different – drier, more chewy and cakey than if using oil. That being said, I don’t recommend this if you’re looking for the best flavor – but it is an option. A better choice is to replace some of the oil with buttermilk – a liquid that still has some fat. 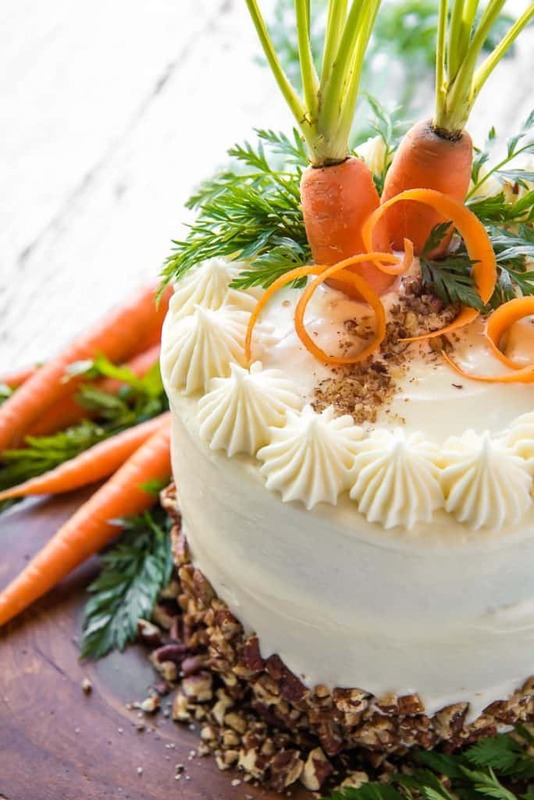 There are so many fun and easy ways to customize your carrot cake with decorations! As for mine here, I garnished the sides with toasted and chopped pecans, sprinkling the remnants in a line across the top. I used some leftover cream cheese frosting to pipe a border along the top. 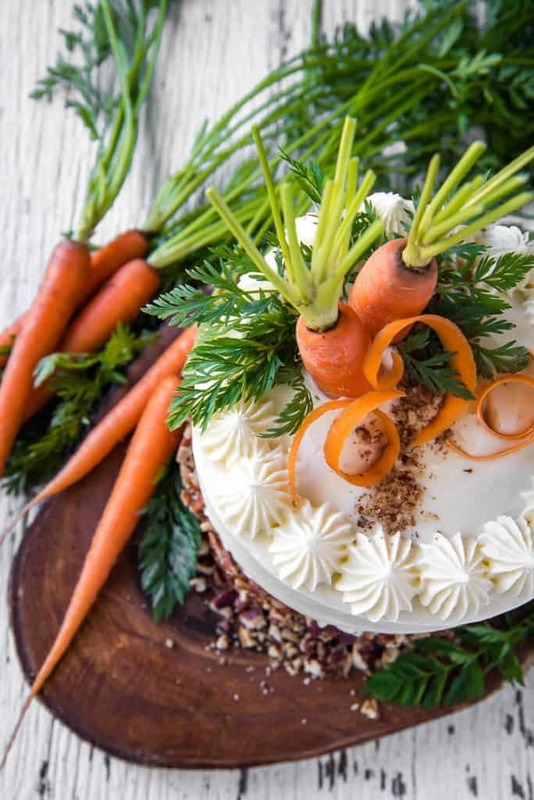 The crown of the cake is made up of carrot tops (leaves included) and twirls of carrot made using a potato peeler. This carrot cake is covered in homemade cream cheese frosting which does need refrigeration. When you’re ready to serve some of the chilled cake, slice off the amount of pieces you wish to serve and let them sit at room temperature for 30 minutes. Thawing slices instead of the whole cake cuts down your the waiting time by over 1 hour! Of course, you could always just eat it cold, too. Then, sift together flour, baking soda, baking powder, salt, cinnamon, and nutmeg in a mixing bowl. Whisk everything together well to combine. In a separate large mixing bowl, use a whisk or hand mixer to beat together the eggs, sugars, oil, applesauce, and vanilla until well combined. Add the dry ingredients and mix until everything is just combined (some small pockets of flour are OK). Next, stir in the grated carrots and coconut. Fold in the toasted pecans until the batter is evenly combined, then divide it evenly between the prepared cake pans. Bake the cake for 25 to 35 minutes (depending on cake pan size), or until a toothpick inserted into the center of the cake comes out clean. Pour warm buttermilk glaze over the hot cakes and let them cool in pans for 15-20 minutes, then turn out onto a wire rack and cool completely. Finally, fill and frost the cakes and decorate as you would like. Refrigerate any leftovers in a covered container for up to a week. 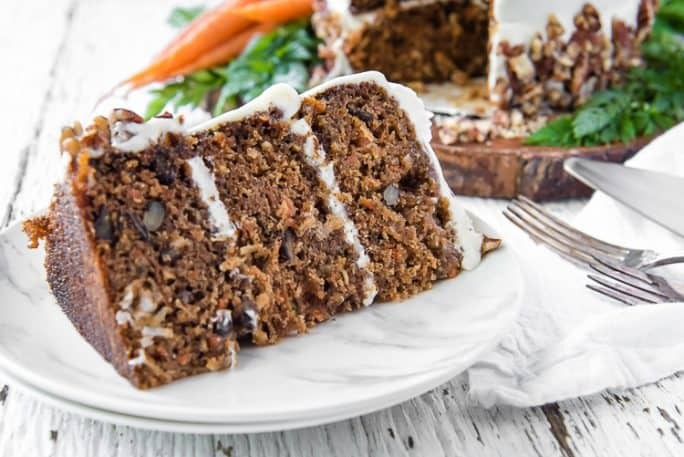 What Is The Secret To Super Moist Carrot Cake? 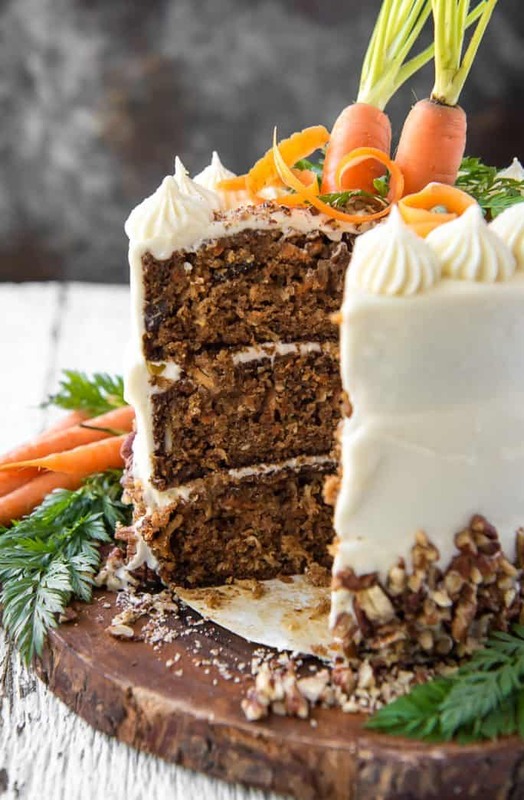 Most bakers will tell you that the key to moist carrot cake is simply using oil in the batter. My secret is actually a simple 5-ingredient buttermilk glaze. The glaze is made in 5 minutes (no less!) on the stovetop while the cake bakes, then brushed or drizzled onto each layer as soon as it comes out of the oven. The hot cake layers easily soak up the thickened glaze, and it makes an ordinary carrot cake insanely moist and delicious. Note that, because of using this glaze, the amount of sugar in the actual carrot cake recipe is less than most. Adding additional sugar to the cake batter, drizzling on this glaze, and covering the finished cake in cream cheese will put you in a sugar coma. In a large bowl, add flour, baking soda, baking powder, salt, cinnamon, and nutmeg. Whisk well to combine. In a separate mixing bowl, beat together eggs, sugars, oil, applesauce, and vanilla until well combined. Add the dry ingredients and mix until just combined. Stir in carrots, coconut, and pecans until evenly combined. Bake for 25-35 minutes, or until a toothpick inserted into the center of the cake comes out clean. Pour the warm buttermilk glaze over the hot cakes and let them cool in pans for 15-20 minutes, then turn out onto a wire rack and cool completely. Add all ingredients except rum to a small saucepan set over medium-high heat. Bring them to a boil, stirring often, 4-5 minutes until combined. Remove from heat and stir in rum. Set aside to cool briefly before pouring over cakes. Add butter to a medium mixing bowl. Using an electric mixer fitted with a whisk attachment, whip 3-4 minutes until pale and fluffy. Add cream cheese and whip and additional 3-4 minutes. Use a rubber spatula to scrape the bowl, then sift powdered sugar and salt into the mixture. Mix on low speed for 1 minute, then increase speed to medium-high and whip for 2-3 minutes until well incorporated. Scrape bowl again, then add rum and heavy cream. Whip 3-4 minutes until fluffy and smooth. Level the tops of each cake layer with a long, sharp knife. Place one of the layers on a cake plate or stand, then spread ⅓ cup cream cheese frosting in an even layer. Repeat with second layer. Place the third layer on top and use the remaining frosting to coat the top and sides of the cake, saving some to pipe a border on top if desired. Garnish the sides and top with chopped, toasted pecans and carrot tops and curls. Carrot Cake recipe heavily adapted from the The Food Network. Rum Buttermilk Glaze adapted from My Recipes. 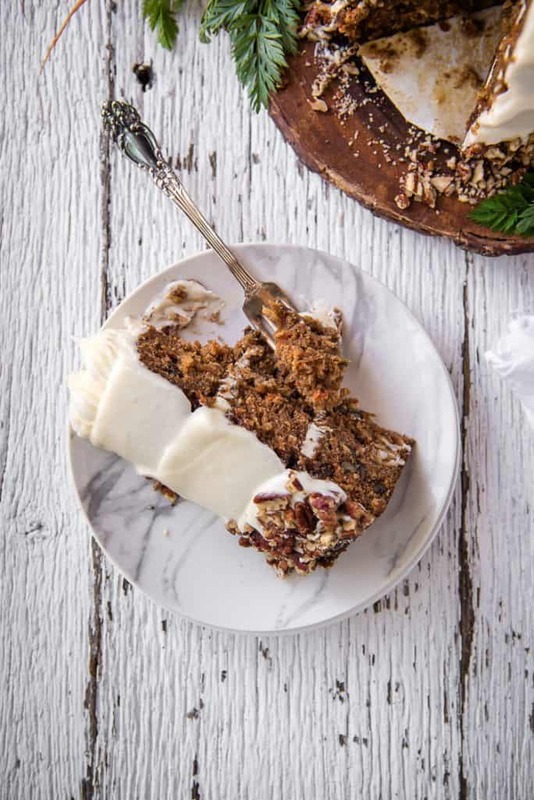 PIN THIS CARROT CAKE RECIPE FOR LATER! Hi Kate! Thank you SO so much for your feedback – I love hearing positive reviews like this! I knew I had to get it on the blog when I made it for my cousin’s birthday back in January and, between 5 of us, we almost devoured the entire cake in one night. :p I’m so happy to hear your family loved it, as well!